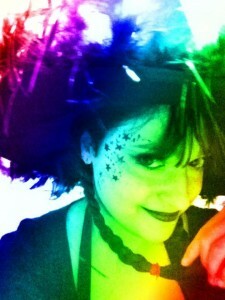 Returned from Baltimore Book Fest , wet and not unscathed — darn cold fingers and steel corset snaps! Pictures will be up…soonish (and not of the thumb injury, because I will not have you guys all freaking out on me again. Suffice it to say it’s bad). Came home to exhaustion and HERO’s edit letter, which looks to be three pages of NO SMALL FEATS in which I turn a pretty good manuscript into a REALLY FREAKING AWESOME BOOK. I have a week in which to do this. Then it’s off to NY Comicon (will post schedule later, but for now you can always find me at Janet Lee’s table in Artists Alley!) and the meeting with said editor in which I get to confess all my sins if I don’t have that rewrite turned in tout suite. Then it’s a week off (with more edits…this work takes a LONG time) before the Waterworld Mermaids Writing Retreat, in which I plan on being mostly incommunicado while I 1.) Finish HERO, 2.) finish TRIXTER, and possibly even 3.) Catch Up On Some Things. We’ll see. Unfortunately, this blog is probably not going to be one of those things…so do find me on Facebook or Twitter (Mom, you can still watch the Twitter feed from the blog page without having to sign up). Avery put together this SUPER SPOOKY trailer to get you in the mood for The Ghost of Mermaid Lagoon. Enjoy! Love you guys! Be safe tonight. 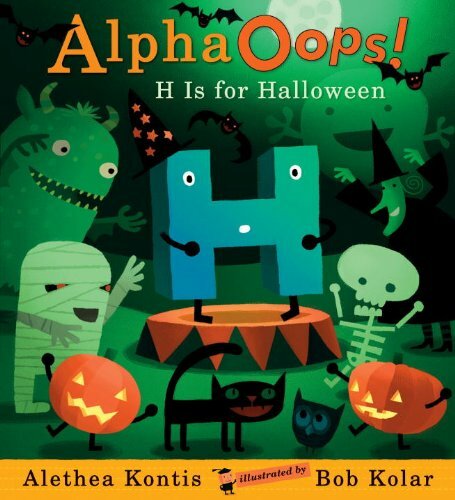 Don’t forget to order more copies of AlphaOops: H is for Halloween! Wanna win a copy of AlphaOops: H is for Halloween? I’m giving one away! 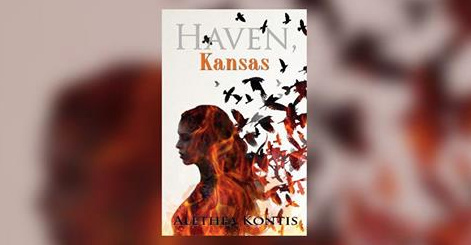 Go sign up on Goodreads! Giveaway ends October 24, 2011. Those of you on Facebook & Twitter may remember the Friday night before Baltimore Book Festival when the Cutest Customer in the World visited me at the bookstore. It was late–within an hour or so of closing–and I overheard some customers in the children’s aisle talking about the National Book Festival. I had forgotten that the big book festival in DC was the same weekend the SFWA had me scheduled at their booth in Baltimore…but when America decides to have a Book Week, it’s inevitable that these things happen. Things were slow in the store that night, so I turned to Kilian and said, “I’m going to be nosy,” and I went over to talk to this lovely, animated family. I hadn’t done any research on the DC book festival, so I didn’t know who was going to be there, but I’d been once before in the past. The authors are usually Very Big Names, and the queues for book signings are usually Very Long Lines. So I went over to these folks to ask about who would be at the DC festival, who the adults and the children were looking forward to seeing, and…I’ll be honest…just to be excited about books in general. Sharing book love is never a bad thing. The only reason I mentioned my writing to Kristin, once we got to talking, was because she had just told me about a local indie bookstore called One More Page that catered more to up-and-coming authors than the Big Shot Wonders of DC Book Festival caliber. I said that it sounded right up my alley, and then (since they asked) showed them one of the few copies of AlphaOops: H is for Halloween that we’ve been able to bring into the store. Well, yes. Of COURSE it was! I signed it to her right then and there. She was so happy. I rang up their purchases and wished them well and sent them off to a good night’s rest before our respective days of Book Festival Adventure. Lorelei totally made my night (even after some guy came in at the 11th hour and yelled at me because the computers won’t let anyone return a book without a receipt. Ah, the joys of retail). The coolest part about this whole meeting–hooray for moms who keep blogs!–is that you can pop on over to Coastal Conversations and read Kristin & Lorelai’s account of what happened that night. There are also a couple of short video clips of Lorelei with her favorite new book. I will treasure these forever. Thank goodness for the internet. And thank goodness for Lorelei! It is meeting people like her that make me remember why I do what I do, against all odds, to bring a little bit more sunshine into this world. Maybe you missed it last year. Or you didn’t happen to love me then as much as you do now. Whatever the reason, IT’S OKAY. 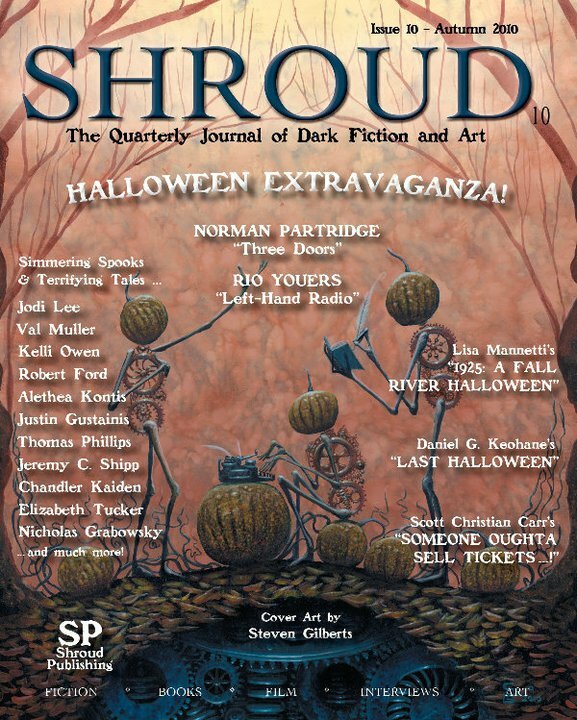 You can still purchase the special Shroud Halloween Issue guest edited by Kevin Lucia. This issue has my story “Red Lantern” in it, which is…not so much a retelling; more of an homage…to the Jack O’ Lantern myth. I promise, it has nothing to do with DC Comics. 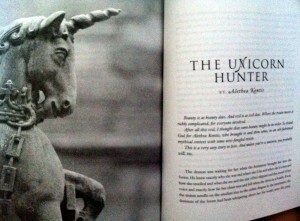 When an author comes across the perfect title, geek or not, she just can’t pass it up. Wanna see how perfect a title it is? Purchase the Shroud Halloween special issue (only $7.99!) and see for yourself. A funny thing happened last year. But then, I am the Princess of Funny Things, so this shouldn’t come as a surprise. Last summer, I had a new picture book come out. You might remember it: AlphaOops: H is for Halloween . It’s the sequel to AlphaOops! : The Day Z Went First . I was shocked to my toes when I sold it to Candlewick–I sent them the manuscript, and within twenty-four hours, I had a very enthusiastic response to buy it. The circumstances surrounding the original AlphaOops purchase were so incredibly out of the blue–this was a real coup for me. I’d sold a sequel. Here it was: proof that I wasn’t just a fluke. The publisher was so sure of H is for Halloween‘s success, that they wouldn’t let my agent include a clause in the contract allowing me a bonus if the book hit the New York Times bestseller list. Since it was a seasonal title, they knew it had a very good chance of hitting the list and somehow still not making enough profit for them to warrant giving me a bonus. 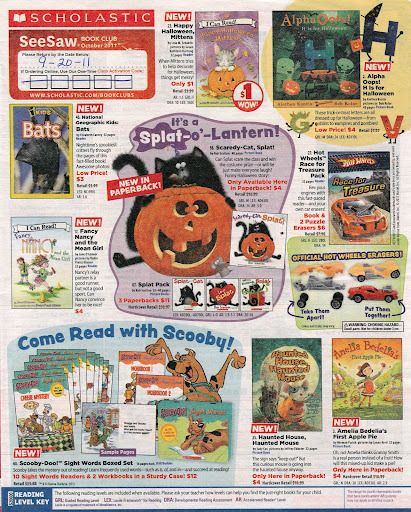 After all, they’d have to pay my royalties as well as Bob Kolar’s, and Halloween books don’t just sell through Halloween…they STOP selling on Halloween. The book would be released in July, but it really had only a month to sell: October. Thank goodness Halloween comes at the end. It took forever for the reviews to start coming in, but they finally did. And they floored me. I had never received a “starred review” before and suddenly I had two: from both Publisher’s Weekly and School Library Journal. This was huge because I know a lot of schools and libraries don’t even bother ordering anything that doesn’t get a starred review–some of the larger libraries just keep all the starred review books on standing order. And though you don’t have to read to the first book to enjoy the second, most of the reviews mentioned the first AlphaOops…which meant great potential for backlist sales. I gave away my personal review copy of H is for Halloween before the release date, in an auction to benefit the Nashville Flood victims. The auction went off with such a bang that the auction-holders cut off the auction when the bids reached $80. I wonder what number it would have reached if they hadn’t. All the signs were there. Finally. Finally I would be able to live as a full-time author. I could still get a part-time job at Starbucks, but only if I wanted to. The gigantic bills I’d piled up trying to survive after escaping from Tennessee would be paid off, and I’d be able to live comfortably. July came–the book’s release date–and I went store-hopping to see if I could find it. Of course not–it’s a Halloween book. Why would bookstores jump the gun? I was a little worried when September came around and I wasn’t scheduled for any in-store events. I introduced myself at the local B&N (I used to do B&N events all the time at the Cool Springs store back in TN), but no one ever called me. Then October arrived. Not only could I not find H is for Halloween on any display table, it was not in any stores–and I looked in three different states. The original AlphaOops was nowhere to be found, either. I tried not to panic. I hosted a contest that essentially recruited a street team of folks to search all over the US, trying to find AlphaOops in bookstores. They were spotted in Michigan, Nebraska, and Louisiana. But 90% of the other folks came up empty-handed (and many were treated less than kindly). I had notes and messages from friends telling me that they wanted to buy my book in stores, but they couldn’t find it. I went back to my local B&N. They treated me like a self-published author. And then the New York Times reviewed my book. The bloody New York Times. It is a well-known fact that the New York Times does not review genre authors. But there I was, in the Sunday edition, in color. I cried and hugged the paper to my chest for an hour. I told myself I was silly, that my fears were unfounded. Surely, if a book was reviewed in the New York Times, it would sell tons, and Candlewick would be chomping at the bit to pick up an AlphaOops: Christmas book. I tidied up a new version of the AlphaOops: Christmas manuscript and sent it off to my agent. But Halloween books stop selling on Halloween. The review came too late. I wouldn’t be hitting any bestseller list–never mind the New York Times. Bookstores wouldn’t have time to order & receive stock before their computers would tell them to return it. Did they order the original, non-seasonal title instead? Nope. Why would they? Finally, my agent got an answer to her “What the hell happened?” email to the publisher. Apparently, thanks to the terrible economy, a certain chain bookstore (that is not currently going out of business) decided to put a price cap on their Halloween books. Most original hardcover picture books cost around $14-17. Their cap was around ten bucks. Anything else, they just didn’t order. So, pretty much, the Big Fat Bookstore didn’t just screw me–they screwed every picture book author and illustrator who had a new release last fall. And god help the ones with original Halloween books. I feel like I should find out who they are and send them condolence cards. So here’s what the publisher is doing: Candlewick is re-releasing the AlphaOops: H is for Halloween: Midi Edition this August. It will be a much smaller format, and priced at $7.99. It will still be hardcover…but I don’t know any details beyond that. As far as I know, they will not be re-releasing the original AlphaOops in midi format. And I hope (for the libraries, anyway) that they will not be putting the original edition of H is for Halloween out of print–despite the fact that Amazon now has it on sale like it’s a bargain table book. What does this mean? I don’t know. I hope that this new midi edition sells like hotcakes, of course…but I don’t quite know how to promote it. I feel like I’m not allowed to get my hopes up at this point. I feel like I’m getting a second chance, but I’m not quite sure what to do with it. Not that I have much time to dwell on it–most of my time these days is taken up with hunting for a dayjob. Candlewick still hasn’t called back about the AlphaOops: Christmas book. And Starbucks hasn’t called me back either. Yesterday I snapped at someone I loved for absolutely no reason at all. I think I’m officially losing my mind. But then, all the best authors do.